Safe and Convenient: The large knob is easy to rotate and allowing you to cut everything safely. The unique construction of this can opener safely and accurately separates the lid on the can without sharp edges. Multiple Functions: It can effectively open various sizes of cans and bottles in seconds. 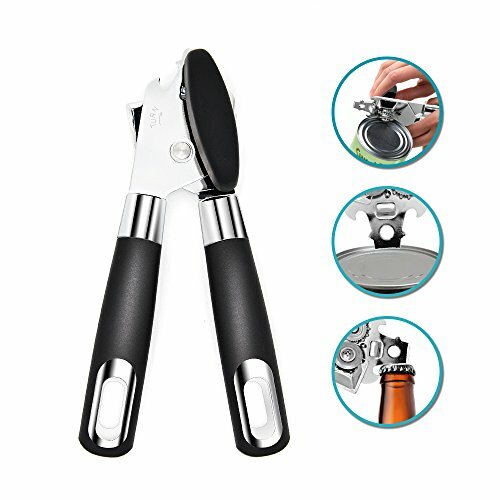 Whether you need to open bottles or cans, such as beer bottles, water bottles, etc. It is an essential tool for dinner, picnics, parties, weddings etc. Durable Stainless Steel: Made of stainless steel with excellent corrosion resistance is very durable, scratch resistant and easy to clean. Sharp blades allow you to cut easily. Non-slip Handle Design: The frosted and non-slip handles make your hands feel comfortable and make it easier to use. In addition, Hanging Hole is easy to store and can be hung anywhere you want. Industry-leading Warranty: At Sonkir, we provide prior high quality product and customer service. We promise 12 Months Hassle Free Money Back or Free New Replacement if you receive the defective products or have any questions before you decide to leave a negative feedback or Review. need a can opener, buy this.